Protesters in Hong Kong are using WhatsApp, Twitter and any number of messaging and social media services to communicate and coordinate their activities as tensions with local Chinese authorities intensify. But one app in particular is getting more attention than usual: FireChat. The messaging app created by Open Garden can send and receive messages without an internet connection. It uses peer-to-peer Bluetooth and Wi-Fi Direct connections to link to other nearby FireChat-enabled devices. If you get enough of those devices in the same area, the result is a massive mesh network in which every handset can message every other handset in daisy-chain fashion – without ever sending a packet over an internet router. So far Hong Kong internet services haven’t been blocked and the cellular networks remain on line (though highly congested), but CNN reports that the Chinese government is blocking protest news and social media posts on China’s mainland (Instagram has been taken offline completely). If a wave of mass internet censorship and network blocking did hit Hong Kong, though, apps like FireChat could still continue to function. On Sunday afternoon in Hong Kong (around 11 PM PT on Saturday), Open Garden started seeing a lot more FireChat activity in region. More than 100,000 new users downloaded the iOS or Android app and signed up for an account, and FireChat jumped to the most-downloaded slot in the iTunes App Store. As for how much off-grid messaging FireChat is generating in Hong Kong, Open Garden simply doesn’t know. Since those sessions take place directly between devices in a crowdsourced mesh network, the messages never hit Open Garden’s servers. Open Garden is just as blind as the Chinese government to those communications, Daligault said. But Open Garden can surmise that off-grid traffic is increasing dramatically by the “on-grid” messages it sees. FireChat users can connect to each other over the internet if they choose, allowing them to communicate outside of their immediate vicinity. Over the last 24 hours, FireChat has logged 800,000 on-grid sessions in Hong Kong alone, each with an average duration of 3 minutes and 35 seconds. As of 9:40 PM Hong Kong time (6:40 AM PT), there were 14,000 simultaneous Hong Kong users logged into FireChat’s on-grid chat rooms, Daligault said. Many of those were organizing specific protests and rally points, according to Daligault. Once users actually arrive at those locations, they’re presumably linking together directly through Bluetooth and Wi-Fi. At that point their conversations disappear from FireChat’s servers. Daligault added that the off-grid capability is that much more important, because there are numerous reports of congested networks in hotbeds of protest activity like the Admiralty and Wanchai districts. FireChat does have some limitations. Unlike its first incarnation, FireChat today isn’t entirely anonymous. You now have to register with an email address and user name (Daligault is recommending Hong Kong users register with false names). And while protesters can communicate in spite of government efforts to stop them, those same government authorities can listen in on those conversations. They just need to download the FireChat app and join the crowd to get plugged into the hyperlocal network. That said, it looks as if dissident groups have found a handy new tool for organizing under a highly authoritarian and censorship-prone government. I expect we’ll hear a lot more from FireChat around the world wherever we see new protest activity. 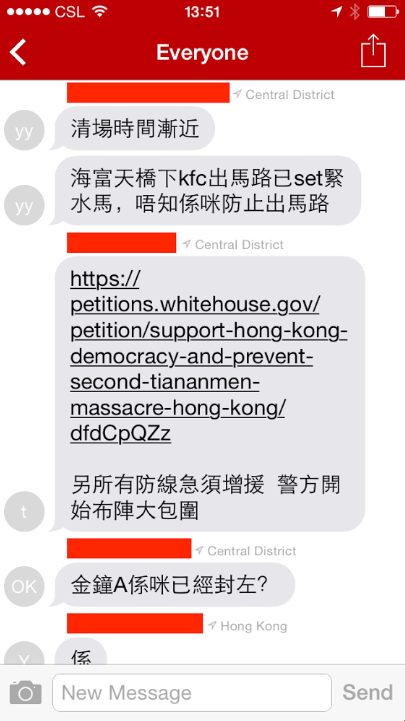 Not the first time FireChat has been used for organizing protesters. The lurking threat of government intervention in the use of internet-based communications reinforces the need to support platforms like Open Garden and apps like FireChat. Other alternate network delivery solutions were also used in various Arab Spring protests when frightened tyrannical governments and dictators “pulled the plug” on internet access. Democracy movements and the democratization of the off-grid meshed network together again…in harmony! Love it when protesters are smarter than the oppressors. Be safe in fighting for your rights as free people.